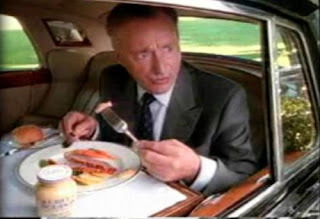 myblackfriendsays.com: Pardon me, would you have any Grey Poupon? I have been sitting here shadow-writing what my comment will be, but have been somewhat paralyzed with how to start. I find it interesting that, as a white man, I feel an almost overpowering need to start my comment with a disclaimer about my upbringing, race relations history, or some other qualifiers before my opinion on these matters can be heard. Even in this beginning, my attempt to NOT qualify my comments, I find myself sneaking up on statements that would 'earn' me a place at the table. It occurred to me, during this internal debate, however, that unless your followers are always the same and diligent at recalling my qualifiers (assuming that my history even makes me worthy), then I would be forced to qualify every comment to every post... ad nauseum. But isn't that part and parcel to what you are trying to accomplish? Open dialogue, where people can ask questions, debate beliefs held, and challenge ideas is the only way we can ever make any progress. Perhaps it also gives you an insight into what a white person thinks when a black person makes a comment about race: "Okay, how do I respond without being offensive?" or "How can I demonstrate that I'm not a bigot before sharing?" Once I had insight into this knee-jerk reaction I had, I was able to take control of it. The truth is, my first thought was still the old one that had haunted me all those years, but the power came from recognizing that it was my own creation and choosing to believe that "she" just wasn't the right one for me. So, maybe the girl at the thrift store was a racist. Like you said, you can't know for sure. And if assuming she is makes you unhappy, assume something different. Make up a story that doesn't anger or upset you and save your fight, save your fire for an opportunity to actually make a difference. Like when racism is known and addressing it can change a situation. Whites are always saying that people of color "go there" or "pull the race card" too often or too quickly. I think that a lot of that is whites not wanting to take the necessary, long, hard look at a situation, but I believe that there is some validity to the notion that if someone jumps to any conclusion too often or too quickly, they start to see that conclusion played out everywhere. Mozel Tov, Mabrook, Congratulations on your 100th blog black friend. You are amazing! Thank you for the thought provoking post that provoked so many questions in me. Does the mere uneasy feeling that perceived bad manners could be race-based bias prove that perhaps biased behavior truly exists? I mean if you never experienced race-based biases would you even suspect it? Does the advice of our white friend, John C, who suggests to assume good pacify a need to not stir the pot? Could it be more important to have the uncomfortable conversation about the prevalence of prejudice and bias and racism even if it is an assumption? Could cart lady possibly not say excuse me to anyone? Maybe white people have no manners? Oh no wait...I'm white and I say excuse me a lot, too much. Yesterday, to achieve a quick dinner, I was rushing myself and my four year old daughter through the grocery store. This is not an easy feat because she is a curious being and no simple task is, well simple. I am tired, rushed and grouchy exerting too hard to corral a being who is much more wily than I. A man who is black passes me and we make eye contact. I usually say "hi" to anyone to whom I make eye contact. I didn't this time. I immediately felt bad and hoped that he didn't think I was acting with bias either because of his race or gender. I over-thought my action and wondered if I would feel as bad if it were a white women. My worrying stooped when I had save the display of fruit roll-ups from my daughter's grasp. So I wonder, will there be a time when race relations are organically, comfortably symbiotic enough that self conscious efforts to appear non-racist, and suspicious assumptions of racist behavior occur less? If that should be a goal, my Utopianism would like to believes it should, how do we progress as a society to achieve a relationship without prejudice and bias, and even beyond tolerance? This happens all the time......I'm white. White/Black/Red/Blue/whatever color he/she may be......they are all just grow more and more rude by the day. Carema brought up an interesting point--I find myself being more friendly to black people than white people sometimes because I semi-consciously want to prove that I am not racist or overcome the automatic perception of bias. Bad? Good? I don't know, but it's there. OK so I wrote a long comment, did a preview, and then could not find my way back to the editor to change it. Now it has disappeared. Sigh. Now it did it again and saw the little link in the preview saying editor. Double sigh. I would assume that the person was expressing some racism, or racish attitudes. And apart from that I would deal with the rudeness to take care of myself: to dispel my anger or fear. If I decided to call them on it, I would focus on their behavior and its impact on me without speculating on their internal attitudes. If it were racish, this would also be valuable for them, to pop their bubble of privilege and interrupt their denial as a strategy for life. If you did that to me, I would be devastated, want to disappear, apologize profusely, and . . . Well, I wonder what I would make of it the next day. rebecca - you have made a huge logical fallacy. myblackfriendsays has not disavowed that people can be rude regardless of their recipient; only that it is a possibility it is because of her race. otoh - myblackfriendsays - i disagree that there is no fourth option for white people. first, i would add two options for all people "there is something (besides race) about my appearance that has made this person decide s/he is better than me"; this person is from another country (and i DON'T mean black, latin etc) - for instance when i was in italy - people stand on top of each other in line and push to the front - - i've heard it's similar in some asian countries . . .
but to get back on topic. as a white person, if the rude person in question is a poc - i will wonder if it is because i am white. i am not making a one to one correlation in terms of what this means - - i make no crazy claims that this amounts to reverse racism. but i will think - maybe they just don't like me because i'm white. i'm happy to go on if someone requires more to my explanation - at the moment that rings of justifying in my head.